It won’t be long until Dave and I make the lengthy journey back to the UK. Frustratingly, as we fly to/from Manchester airport, this always involves a connection. Heathrow is simply ungodly so we’re going via Amsterdam. I can’t tell you how irritating it is to have to fly east in order to then return basically directly over Manchester Airport! Anyway, before we return to the land of grumpy Mancunians (on my return from Australia in 1999, my primary memory of the airport was that everyone was scowling), we’ve taken a couple of days to get a bus up the road to Whistler, to enjoy some of the 40 feet of snow that’s fallen here this year. We’re also planning to visit the mountain resorts nearer Vancouver – but we might be hiking. The unseasonably warm weather has melted much of the snow and it won’t be long before the bears start emerging from hibernation. Today Dave and I were using the opportunity to try out some of our new toys. Last time we were here, I fell on my head and spent the rest of the day feeling seasick. As a consequence, I have joined the ranks of skiers wearing helmets. My new white Giro helmet did me proud! Toasty warm, and I was only *slightly* deaf from the ear muffs. Another new toy is the GoPro headcam we’ve bought. We ummed and ahhed about this for a while – after all, it’s a not-insignificant chunk of cash, and another item to drag around with us (we’re not minimalists even when we backpack). But after trying to take footage with Dave holding our little point-and-shoot camera, it became apparent that we either had to satisfy ourselves with still images, or invest in the new toy. So the new toy won! No doubt Dave will be crafting something beautiful from today’s skiing, and posting it on his blog. Now, I know the pole comes in 3 sections. Usually, however, the bottom section isn’t bent and sheared off. 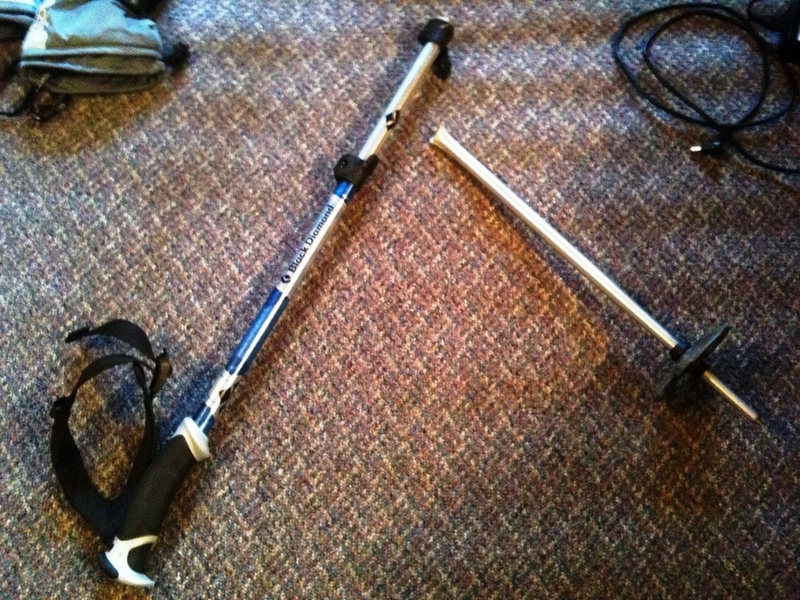 That’s a special feature of what was my right pole, due to a collision with a speeding snowboarder. Thankfully, the speeding snowboarder was Dave, and no legal action needed to be discussed. I was wearing the headcam and rather focused on following Nick, a colleague of Dave’s who’d joined us for the morning. Dave was cutting across to meet me and we collided at fairly exciting speed. Luckily, we basically bumped into one another and managed not to hit one another with skis or boards – that’s what normally injures you. Both my skis popped off and I landed on my side, with my new sparkly helmet protecting my head from the snow (although I did get a bump). Dave landed on his backside, tore off his board and ran up the slope to discover that I was fine, the camera intact (and capturing it all) but one ski pole was now in two pieces. You can hear me on the audio of the film, tearfully saying “fifty quid! what a waste of fifty quid!”. As we later agreed, if the choice of breakage was person, new camera, rental skis or cheapish poles, we’d both take damage to the poles. Lucky stars are thanked and blessings counted accordingly. The slow-motion of the crash has kept us entertained all afternoon!